Fulfils all requirements of formative assessment for the CCE (Continuous & Comprehensive Evaluation) system of education. Unlike regular books which try only to find out how much a child knows, the Perfect Genius worksheets measure how well a student has understood concepts. Covers 309 skills in the form of 106/ 100/ 103 worksheets on Scholastic Areas Sciences (including Social Science), English and Mathematics respectively. The solutions to the 309 worksheets are provided at the end of the workbook. The workbooks follow the chapter plan of NCERT books (based on NCF 2005). There are 2 parts in the workbook - Science & Social Science. In Sciences, Science part has been divided into 7 chapters containing 45 worksheets whereas Social Science has been divided into 9 chapters containing 63 worksheets. Builds a Strong Foundation for NTSE, Olympiads, IIT-JEE and other exams. Perfect Genius does not restrict to the academic requirements but will question the students on various aspects required for a Good Intelligence Quotient. The exercises generate enough triggers for students to expand their learning horizons. The questions designed aid in the establishment and encouragement of critical thinking. The students will be able to present and create opinions and make judgments developing the higher order thinking skills. The student will develop not only scholastic abilities but there will be an overall holistic development - Life Skills, Attitude, Values. This Combo offer has 2 components 1. Free online personal online Olympiad exam hall where many practices tests are assigned so that the child can confidently take Global Online Weekly science Olympiad test (GLOWSOT) and Global online weekly Math Olympiad test (GLOWMOT) series. 2. Perfect Genius is a collection of self-indulging user friendly worksheets (designed in 4 colour format) which is based on Bloom’s Taxonomy. As per the Bloom’s Taxonomy, there are six learning stages which shows the shift from the lower order thinking skills towards the higher order thinking skills - Knowledge, Comprehension, Application, Analysis, Evaluation & Creation. Perfect Genius formative Activity Worksheets for Class 4 (based on Bloom's taxonomy) is the scientifically designed workbooks for Sciences (including Social Science), English & Mathematics, which has the following features: Fulfils all requirements of formative assessment for the CCE (Continuous & Comprehensive Evaluation) system of education. Unlike regular books which try only to find out how much a child knows, the Perfect Genius worksheets measure how well a student has understood concepts. Covers 309 skills in the form of 106/ 100/ 103 worksheets on Scholastic Areas Sciences (including Social Science), English and Mathematics respectively. The solutions to the 309 worksheets are provided at the end of the workbook. 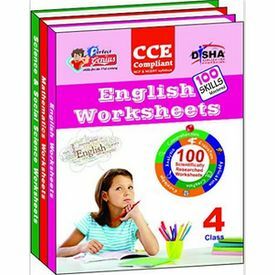 The workbooks follow the chapter plan of NCERT books (based on NCF 2005). There are 2 parts in the workbook - Science & Social Science. In Sciences, Science part has been divided into 7 chapters containing 45 worksheets whereas Social Science has been divided into 9 chapters containing 63 worksheets. These worksheets have been classified in the 6 learning stages of Bloom's Taxonomy. Benefits of Perfect Genius: Builds a Strong Foundation for NTSE, Olympiads, IIT-JEE and other exams. Perfect Genius does not restrict to the academic requirements but will question the students on various aspects required for a Good Intelligence Quotient. The exercises generate enough triggers for students to expand their learning horizons. The questions designed aid in the establishment and encouragement of critical thinking. The students will be able to present and create opinions and make judgments developing the higher order thinking skills. The student will develop not only scholastic abilities but there will be an overall holistic development - Life Skills, Attitude, Values. As children are most receptive to learning during young age, a time when they are not influenced by a lot of external factors. So the right time is to start NOW.